Special delivery. 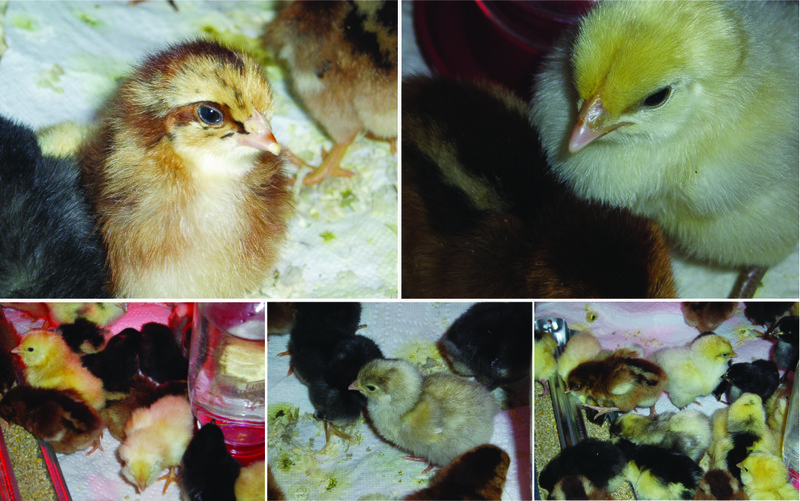 Chicks are here. The birds arrived this morning. Jeremy and I scooted out to the post office to pick up a tiny box full of day old chicks. The box was a peeping ruckus. Loud. Jeremy and I were thrilled to go collect them. The postal workers were, I think, thrilled to get rid of them. It seems all productivity for the day is on hold. Adorable chirping babies are far too great a distraction. 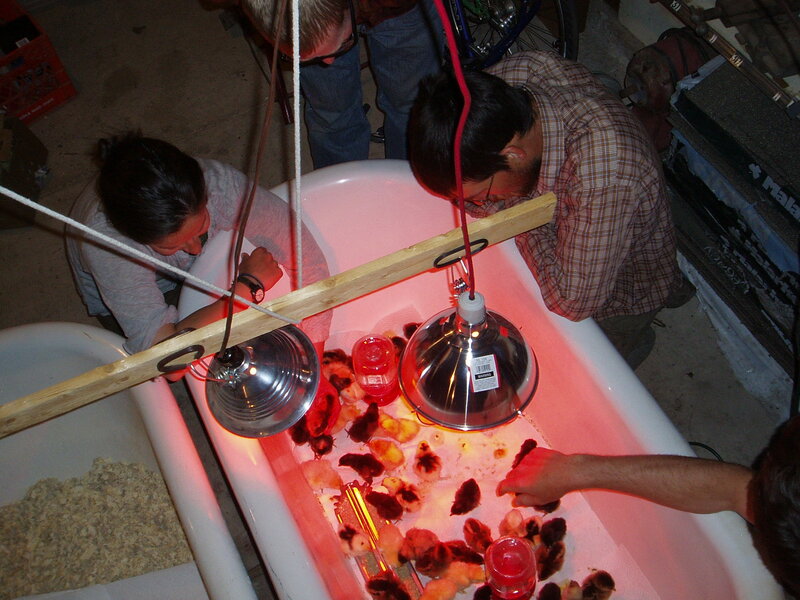 Right now they are set up in salvaged cast iron bathtubs under heat lamps in the garage. They are very chirpy. And endearing. They are all varying degrees of fuzzy and adorable. Pale yellow ones and rich buttery yellow ones, black ones and yellow and spotty black ones. There are a few with a fun sort of chipmunk, stripey-thing going on. Some individuals have quirky, identifiable features, like a mostly yellow one with a single black dot on the top of its head. One with big fat feathery cheeks/muttonchops. One with a mohawk. And one with extraspecially hairy legs. Aside from chicken-sitting a few times for friends, neither of us know too much about birds. We were sure that we wanted birds though, in part to diversify our market, with eggs to sell. And, in part, to incorporate livestock into our management plan for land health, pest control, and compost. Since we don’t have any preferences for certain breeds over others, we ordered a mixed bag of heavy layers, straight run. We ordered birds from the Sand Hill Preservation Center, a group that does wonderful work preserving heritage and rare poultry breeds. The varieties we received are Barred Holland, Mottled Java, Partridge Barnvelder, Salmon Faverolle, and White Orpington. As a straight run, some of these little ones are male. We won’t keep the males much past eating age. This is something else we’re going to have to learn about: meat processing. But we’re not there yet. We’re all still at adorable. This entry was posted in farm update and tagged chickens by Cycle Farm. Bookmark the permalink. I AM SENDING THIS TO AVERY ASAP. omg. PLEASE beam me to SD right now. Like, RIGHT NOW. Get yer macro-photography on and take a photo of those muttonchops and extrahairy legs. I gotta see this stuff. P.S. Tucson hugs to you two. BIG RIB CRUNCHER ONES. Mille says “hi” too.